Looking for necessities to complement your school room? 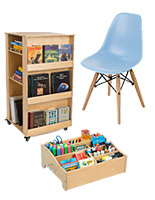 Our assortment of classroom easels provide everything teachers and kids need to read, write, draw, paint, and bring their ideas to life. 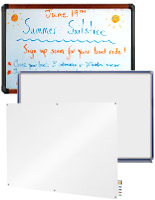 Our dry erase boards come in assorted sizes and shapes and offer several convenient features including shelves and trays to hold supplies. 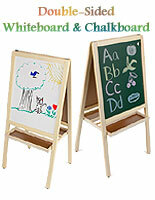 We have classroom easels with chalkboards as well as units with whiteboards. Some of our stands can even be used with both wet and dry erase markers, making it a versatile fixture. 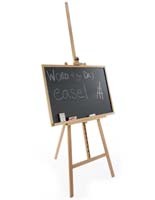 We have classroom easels with whiteboard magnetic writing surfaces, ones that are double-sided, and even models with wood accents. Browse our large catalog of board displays to find one to best suit your needs! How can I use these marker board and chalkboard displays? How can I use these marker board and chalkboard displays? 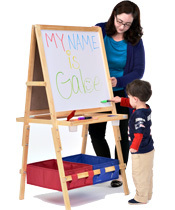 Classroom easels are great for learning environments. Teachers can use them as a part of their lesson plan or for creative activities. 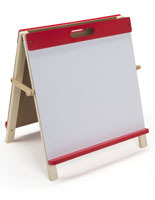 Some of our marker boards have a mobile design - built with wheels to move freely around the room. 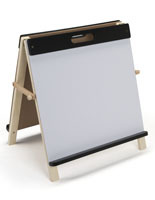 Nurture your little artist's talent with teaching easels that feature chalkboards, marker boards, or pads of paper built in to the stand. Kids will love the fact that they can create their own masterpieces and display them on their own. 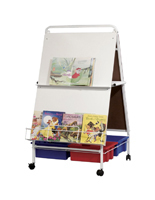 Art stands with storage are great for playrooms and homes to create a fun space for kids to show their creativity. These are made of wood, for strength and durability that is simple to move from room to room and small enough to not take up lots of space. Educational stands for younger children can also be made of metal, but wooden and plastic styles designed to stand up to the enthusiastic play of kids are more common. Choose the model that best suits your location and make every presentation an educational experience. 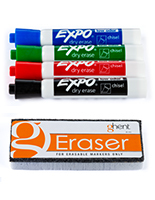 If you’re looking for accessories for your dry-erase board, look no further because we have a marker set and eraser combo you can purchase separately! Displays2go has a wide variety of tripods and freestanding displays for any commercial environment, school, or restaurant. 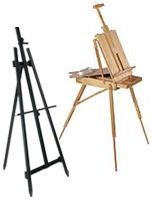 Are you someone who travels around to trade shows or expo events and needs an on-the-go easel? We have portable display stands that folds up into a convenient carrying case that can be taken with you wherever you go. Shop online at Displays2go for quick shipping and low prices.